Airborne infectious diseases transmitted during commercial air travel are of concern to public health officials. In 2002, 20 people on an international flight were infected by a single SARS patient. A new study is expected to provide the first detailed information on how infectious diseases may be transmitted onboard commercial airliners. Sponsored by aircraft manufacturer Boeing, the research will document patterns of passenger movement inside aircraft cabins and inventory the microbes present in cabin air and on surfaces such as tray tables and lavatory fixtures. The information provided by the three-year study could help improve health and safety for both passengers and airline flight crews. Researchers from the Georgia Institute of Technology and Emory University are working together on the project, in collaboration with environmental sustainability personnel from Atlanta-based Delta Air Lines. "The ultimate goal of this project is to reduce the transmission of infectious diseases on aircraft," says Howard Weiss, a professor in the Georgia Tech School of Mathematics. "We will learn how people move around in aircraft and study the microbes that are there at different times during flights. From that information, we can start modeling the disease transmission and developing intervention strategies." Airborne infectious diseases transmitted during commercial air travel are of concern to public health officials. In 2002, 20 people on an international flight were infected by a single SARS patient, which showed how air travel could serve as a conduit for the rapid spread of both emerging infections and pandemics of known diseases. Researchers know that bacteria and viruses can be transmitted in three ways on aircraft: inhalation of small droplets coughed or sneezed by infected persons and carried significant distances in cabin air; inhalation of larger droplets that tend to fall within a meter of their sources, and transfer of droplets from surfaces into the eyes or noses of susceptible individuals. 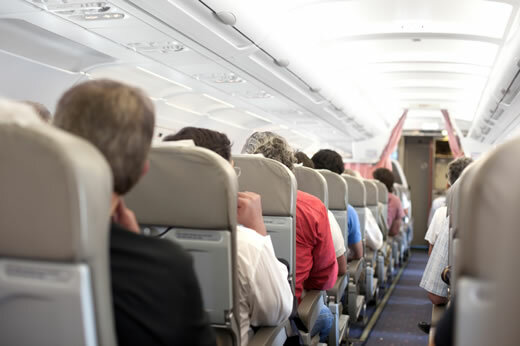 The latter – which may account for as much as 80 percent of the disease transmission – can occur when passengers touch contaminated surfaces, such as seat tray tables, lavatory door knobs or sink handles. Researchers from Emory and Georgia Tech will be studying how infectious diseases can be transmitted aboard passenger aircraft. 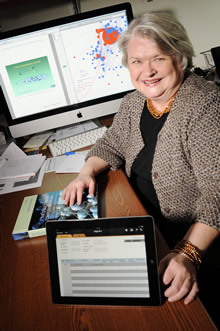 Shown with a diagram of how SARS was transmitted aboard on aircraft is Vicki Hertzberg, an associate professor in Emory University’s Rollins School of Public Health. Photo by Gary Meek, Georgia Tech. "By understanding the patterns of how infectious diseases may be transmitted from an infected person to an uninfected person, companies like Boeing may be able to design aircraft that better protect passengers and crew members," says Vicki Hertzberg, an associate professor in Emory University’s Rollins School of Public Health. "That will put us in a better position from a public health perspective." Using radio-frequency identification tags (RFID), Hertzberg has been studying how people interact – and potentially transfer infectious diseases – in medical facilities such as hospital emergency departments. On aircraft, however, the researchers won’t be able to use such technology because of potential interference issues. However, the researchers will use sophisticated sampling equipment carried aboard the aircraft to gather information about what’s in the cabin air. They will also swipe certain touch surfaces, and both the wipes and air-sampling filters will be analyzed by polymerase chain reaction (PCR) and mass spectrometry equipment to identify the microbes present. To study passenger movements around the aircraft, the researchers plan to use a modern twist on an old-fashioned technique: graduate students watching and recording movement on an iPad. "They will be actively looking at who’s getting up and down, when they are doing it, and where they are going when they do," Hertzberg explains. "We will need to do this at a fairly high resolution with respect to time and place." The researchers plan to put students on eight Delta flights using Boeing 757 aircraft. Filters from the air sampling and wipes from the surfaces will be analyzed in a California laboratory that can detect as many as 1,500 different bugs, among them, 300 different respiratory viruses and 1,200 different bacteria. Delta has been advising Hertzberg and Weiss as they design the study, and will allow them to use mockups of aircraft cabins to test and practice their research techniques. "Delta has a long history of collaborating with researchers on safety, health and environmental issues related to passenger aircraft," says Steve Tochilin, general manager of environmental sustainability for the company. "As examples, we are involved in ongoing partnerships with two FAA-funded university consortia focusing on airliner cabin environments, and noise and emission reductions. We look forward to working with Georgia Tech and Emory University on this research." Once data on passenger activity is collected and microbes identified, Weiss and Hertzberg will create a computer model of the social network on an aircraft. That will allow them to study how infections can be transferred in the close quarters of an aircraft cabin. Only in the last decade have researchers had the tools to determine that human movement differs from that predicted by completely random movement, as documented with dollar bill tracking, mobile telephone calls and sensors that can determine movement among conference attendees and students in elementary and high schools. "The most interesting part of this from a mathematical standpoint is that this may be a new type of social network," says Weiss. "For many years, scientists have assumed that people move in a completely random fashion, and this study will provide data on that for the first time." The researchers plan to spend the first six months of the project developing their research techniques, hiring students, and training those who will do the research. They expect to begin gathering data sometime next fall – just in time for annual cold and flu season. Beyond the public health implications, better protecting passengers and aircrews could have a significant economic impact for aircraft manufacturers, airlines, airports and industries that depend on efficient air travel. "Everyone wins if we can eliminate or reduce the air travel disruptions that could result from a pandemic," says Weiss.